The UTS-IP-LR Dust Tight Tablet Tester is designed so that the complete work area room can be cleaned. The housing is dust tight, except for the balance, completely sealed. This ensures that no dust may enter into tester inside all parts of the UTS-IP-LR Dust Tight Tablet Tester that need to be removed for washing. It can be dismantled and reassembled without the use of tools. In the Feeder chute the tablets are automatically de-dusted and transported one at a time to the rake system. Which then takes care of the positioning and orientation of the tablets in the test stations. Through the new positioning method in the hardness tester it is possible to ideally position almost every tablet for a diameter and hardness measurement. The tablet stop, the pusher and the transport segment can be adapted ideally for a product. • Laboratory tester system with PC-Software PH21, fully 21 CFR Part 11 compliant. • Online-Production Survey system in connection with tablet presses. 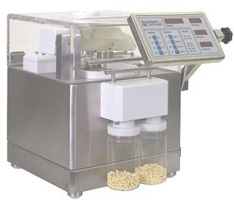 Tablet sampling may be control-led by the tablet press or by the PH21 PC-Software.